There are many dangers on the road. From distracted drivers, drunk drivers, and drivers who don’t know how to drive, we always have to be on guard. But one danger we may not always think about is the presence of animals on the road. Did you know that Pennsylvania ranks among the top 5 states you are most likely to hit a deer, moose, or elk? Because of this, it is very important to know what to do if you find yourself sharing the road with wildlife. Here are a few tips that could help you avoid an accident. You should always be prepared that there may be animals present. If you are driving on a three-lane highway, drive in the middle lane to allow yourself options to maneuver out of the lane if necessary and if you are driving at night, use your high beams when it safe to do so. If you can, the safest option is to avoid driving at night in areas frequented by animals. Finally, slow down. If you are driving in an area that you know has a heavy animal population or you see signs warning of animals crossing, you need to reduce your speed. Slowing your speed will increase the amount of time you have to respond to an animal darting out in front of you and will reduce the force of impact if a collision is unavoidable. And as always, make sure everyone in the vehicle is wearing their seatbelt. Scan your surroundings for signs that animals are present. If you see the tail lights or headlights in front of you flicker, that could be a sign that an animal has just crossed. You will see the same flicker from roadside reflectors if there are animals lingering on the side of the road. Keep a lookout for glowing eyes as well. Your headlights will reflect on the eyes of most animals but know that very large animals such as moose are too large for the headlights to hit their eyes. Even if the animal is on the side of the road, the behavior of animals is unpredictable and it could enter the roadway at any time. And because animals most often travel in groups, be prepared that where there is one, there is likely more. 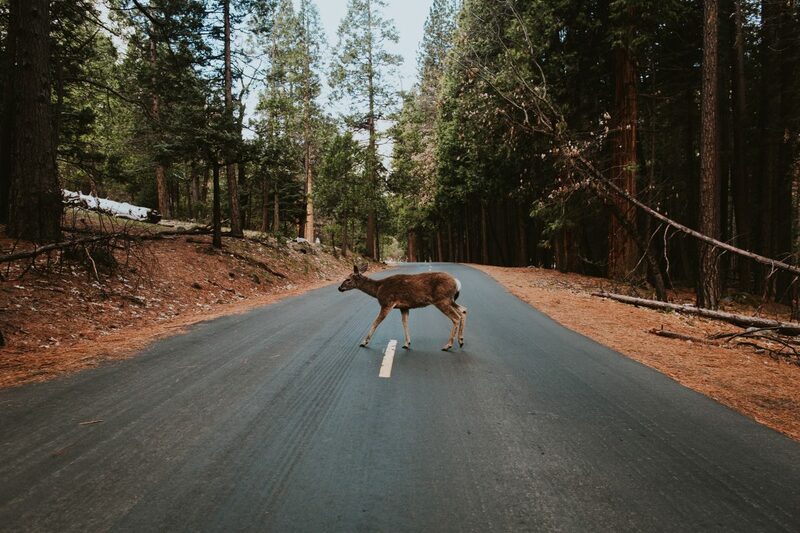 If you do see an animal in the roadway, most of the time the best option is to stay in your lane and firmly apply the brakes. While the natural instinct may be to swerve to avoid the animal, you could end up driving your vehicle into a ditch, or even scarier an oncoming car or body of water. Staying in your lane is the best option in most circumstances unless you find yourself staring down a 1200 pound moose. In this case, you should try to avoid hitting the animal if at all possible as the force of impact with an animal this size could cause severe injury or death. While we do our best to drive safely and avoid being involved in an accident, the unpredictable nature of animals sometimes makes this difficult. If you have been in an accident and need help, contact Limerick Auto Body to schedule an appointment.